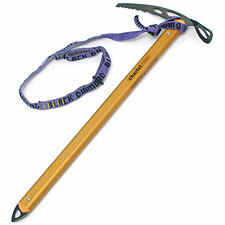 Charlet Moser has merged into Petzl now, which is a shame, because this maker's name is legendary. Though the Snowalker is thus now built under the Petzl name, it remains a brilliant all-purpose mountaineering axe, light yet rugged. The Snowalker effortlessly seems to get everything right—at least for a walking axe. Both adze and spike are made of steel, which you'll want when using your axe as a cane to help navigate talus. The spike is somewhat rounded, which reduces penetration of hard snow, but again makes the axe more effective as a walking stick by keeping the shaft from sinking to the hilt in softer snow. The adze is big, for cutting steps, and optimaly shaped for self-arrest. Despite its durable construction, the Snowalker is surprisingly light, thanks to its aluminum shaft and weight-savings cutouts on the steel components. The shaft of my Charlet-Moser axe was milled smooth. Subsequent Petzl updates have a textured surface built into the handle to make gripping it with soft gloves easier. It's always tempting to go with a light alloy for the entire axe's construction, such as Grivel's Nepal Light; however, the steel adze and point make the Snowalker a far more versatile axe when it comes to glacier travel, general mountaineering, and any unexpected mixed terrain. I particularly like the Snowalker for its simple, clean design. This is the way an axe is supposed to look—and for good reason. You'll not find a better performing tool in this category.